Well folks, I'm in the process of moving to a new home old apartment, so I won't be posting any updates for the next two weeks. The good news is there will be different landscaping and scenery at the new place, so images in the upcoming lens reviews will be fresh and exciting, instead of the all-to-familiar yellow and purple Lantana, TV antennae, Bougainvillea etc. I have two pending lens reviews, and a couple of articles, I just don't have time to finish anything right now. Also notice if you click on an old link to Newcamerareview.com, you'll be sent to a page with a link sending you here. I'm going to retire that site soon because I have to pay for hosting etc, which no longer makes any sense, I simply changed the name of that site to Kurtmunger.com because I don't do many camera reviews, and don't want to be associated with only new camera reviews. There was as permanent redirect from the old to the new site, and most people are still using the old link. I reposted the newcamerareview.com site with the link to the new site just to get everyone on the "same page" so to speak. So if you link to my site, I'd appreciate it if you updated the link. I'll continue to answer my email during the move, though I may be a little slow getting back to you. Thanks for your patience, I'll be back in the first part of August!! I went ahead with the Sony DT 50mm F/1.8 SAM review, because it's new, and seemed more exciting than the Minolta AF 28-135mm, I guess that one will be next. I compared the new lens to the Sony 50mm F/1.4, and have a few surprises (or not) in the bonus section at the bottom, and in the conclusion. This newest lens from Sony is being marketed as a "portrait" lens, so check out the optical qualities to see if it will fit your needs. I'm still wondering why Sony used 50mm, instead of 35mm like Nikon did with the DX 35mm F/1.8 lens. The equivalent 75mm is awfully long indoors or in confined areas. When used specifically as a "portrait" lens, then the focal length is appropriate. As expected, the SAM or "smooth autofocus motor" performed the same on this lens as it did on the kit lens below, which is to say it's no better than the old Minolta slotted screw-drive AF system, oh well. In other news; I put the April home page entries in the "Home page archives" which includes the wildly popular "Dirty lens article." This article link appears in the "Sigma and non-factory misc reviews" box on the bottom left of the lens review page. I may put it on the Nav bar on the left, we'll see. The lens reviews links now have larger size text for the sight impaired, including myself! The brand new Sony DT 18-55mm F/3.5-5.6 SAM review is complete. I compared it to the soon-to-be-obsolete Sony DT 18-70mm F/3.5-5.6. The new lens is better in just about every category, especially color fringing, wide-angle corner sharpness and full zoom center sharpness. Also, I compared the long end of each lens, and found a little surprise, you're really not losing any focal length! See the bonus section of the review for sample crops. The reproduction size is quite impressive, and produced the best shot I've seen yet with a non-macro lens from Sony. I'd say it could easily go head to head with the latest kit lenses from Canon and Nikon, optically speaking, which brings me to the touchy subject of the SAM, or "smooth autofocus motor" that Sony has been bragging about. Claims of "smooth and silent" seem to be misleading to say the least. This in-lens focus motor system is far inferior to the ultrasonic and silent-wave type systems used by Canon and Nikon. 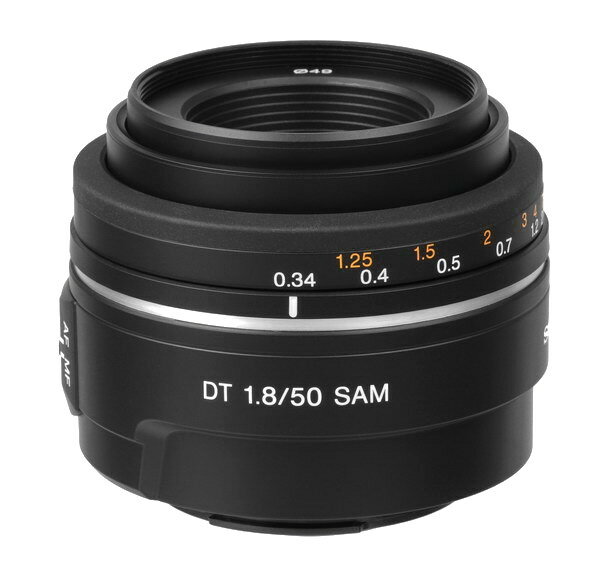 I checked it with the new Sony DT 50mm F/1.8 SAM, it appears to have the same characteristics, so I probably didn't get a bad copy. Go to the bottom of the review and read the conclusion for my opinion of the Sony SAM. I now have the Sony DT 50mm F/1.8 SAM in my lens arsenal, and will be putting it through the paces in the next couple of weeks. 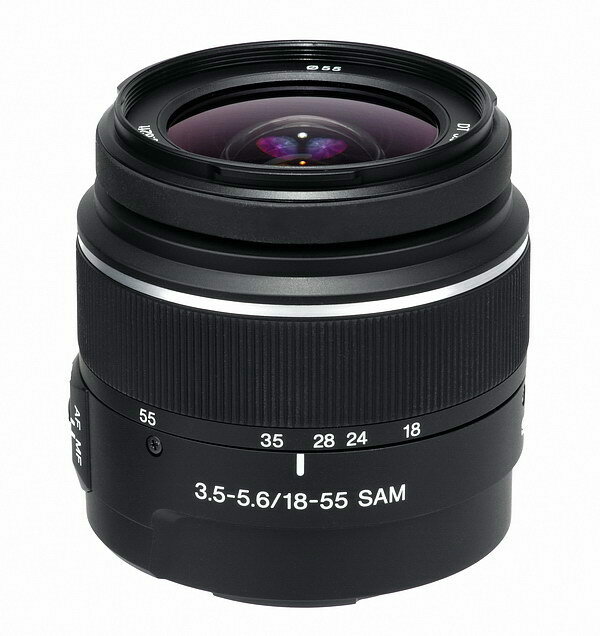 Strange but true; I ordered this lens from B&H photo more than a week ago, and had it in my hands while Sonystyle.com still had the lens listed as a "pre-order item." That's why I don't order from them. I guess B&H photo has initial order priority, even over Sony's own site. As of the time of this update, Sonystyle.com has the lens listed as "back order." I'm not sure of the order, but the next lens review will be either the Sony DT 50mm F/1.8 SAM, or the Minolta AF 28-135mm F/4-4.5, so keep checking back.